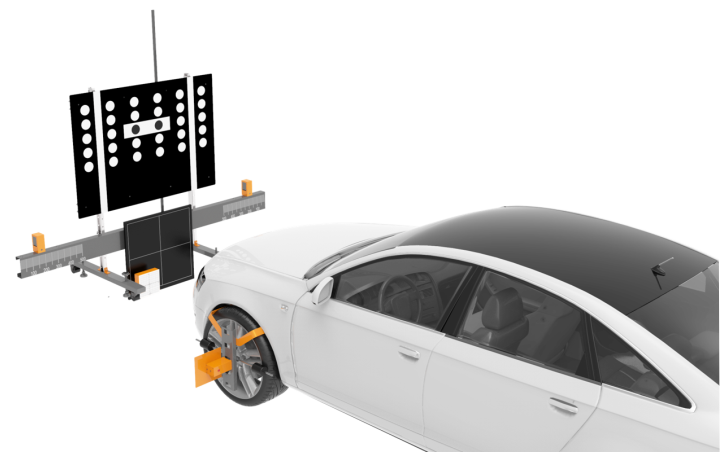 ADAS – Advanced Driver Assistance System. X-431 ADAS is the latest arrival automotive calibration equipment from LAUNCH. It can calibrate ADAS equipped vehicles such as cameras and radar, also will provide OE calibration accuracy. X-431 ADAS consists of two main components: the calibration tool and the diagnostic equipment. Calibration tools including the target frame, the camera boards, the radar target, the laser wheel clamp, the wheel clamp, etc. which calibrate the position of the vehicle sensor and target. Diagnostic Equipment uses LAUNCH scanner tools, such as X-431 Superior PRO 3, X-431 PAD III and PAD V.
Easily and precisely adjust calibration frame to ensure vehicle is correctly centred.